When it comes to maintaining perimeter security, the problem has always been managing low light periods. Large-scale operators on roading or civil projects generally use a combination of tactics for security, but a lack of light remains the single most prohibitive issue. You can employ high fences, mounted surveillance cameras, stern warning signs, alarms and a revolving security guard team but if you don’t have enough light then you won’t be able to see, track and immediately halt intruders before they can do any damage. Yes, in a perfect world, fence mounted motion sensor lights would be receptive enough and bright enough to illuminate the footage that a standard surveillance camera can capture, but they’re not. Night time intrusions are on the rise in large scale, and remote project sites and thieves are operating with more freedom than ever. If they can get over your fence, they can get into your valuable property and the results are costly. Not just vandalism and troublemaking but loss of equipment, materials and even heavy vehicles. You’d be surprised at how many little thugs fancy themselves a digger and how many groups of organised criminals are willing to purchase those vehicles on the black market. The last round of heavy vehicle theft statistics* showed a 74% rise in plant and equipment thefts and a 58% rise in heavy truck thefts across Australia. In 2017, these figures continued to rise with 2,228 commercial vehicles stolen in Victoria alone. Thieves are operating in organised packs to target and strip large and remote civil engineering and road construction projects of their assets. To project managers, this means the unavoidable cost of delays. You’re not only in a position where you have to replace the stolen equipment or vehicles, but you will also be forced to make up lost time on the project schedule, pay more in insurance premiums and face an unnecessary hit on your loss management rating. In the construction industry reputation and relationships are key. You can be someone who’s known for getting the job done – or someone who isn’t. Better perimeter security is the key to solving large construction site crimes and troublemaking of this nature. Increasingly unchecked crime rates on the night shift have stumped owners, project managers and site directors for decades, but a new solution in perimeter security could finally be the answer they’ve been looking for. It comes in the form of solar powered security cameras fitted with a thermal imaging function. Thermal imaging operates in the darkest conditions and completely removes the need for extra lighting. Cameras with this function will detect anything with a pulse crossing your perimeter so thieves can no longer hide under cover of darkness. The moment an intruder makes his way past your existing perimeter security measures, his heat signature will be detected, and an alarm is raised. Catching them before they can do any damage makes such a difference. You’ll no longer be left having to supply your insurance company with grainy crime footage from poorly lit existing cameras. Instead, you’ll be notified by the system, and the police will be on site before the intruders even know they’ve been caught red-handed. Thermal imaging supplies superior visibility in all lights and Spectur now has solar powered, thermal imaging enabled systems ready to set up on your site. Spectur cameras are well known in the Australian construction industry for their long-range image capture ability. The standard thermal imaging function captures clear footage up to 300 meters, and the latest thermal imaging technology increases that safe zone to a kilometre allowing for a more prudent camera placement strategy on large properties. 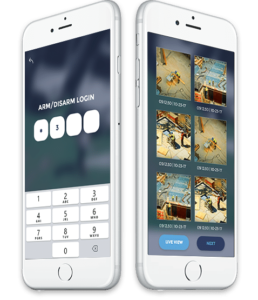 If unusual activity is detected, you’ll be contacted within 60 seconds and be able to log into our system from wherever you are to take action. If you happen to be sleeping, our monitoring team will notify the Police to apprehend thieves before they can damage any property. Why is Spectur the best system for perimeter monitoring? A Spectur system not only requires fewer cameras than a traditional system, it can be rented if you aren’t cleared for initial investment. If you’re getting reports of suspicious activity, there’s no harm trialling the Spectur system. When compared to paying for extra security patrols, the savings are apparent. The cameras themselves are powered by a large solar panel and will operate anywhere that has a 3G or 4G signal. The wireless system means you won’t be required to trench for cables or make final decisions on positioning. 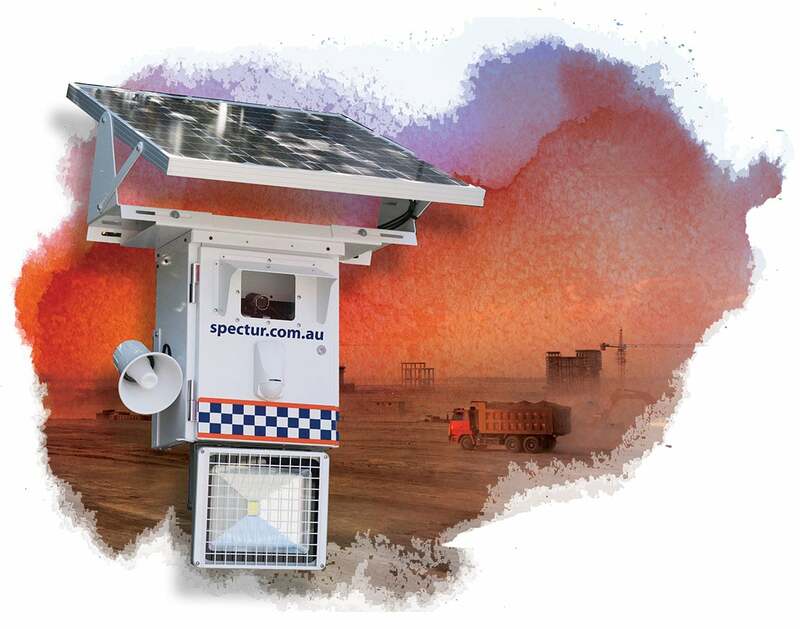 We designed Spectur solar security camera for clients who need rugged, weatherproof perimeter protection. We already secure large construction and civil sites with our standard technology, and we’re thrilled to be offering thermal imaging as an upgrade option to existing clients with our solar security systems or new clients looking specifically for nighttime perimeter security. Take a look at the Spectur thermal imaging difference in the video below and feel free to contact us with inquiries for sites of all sizes. Lack of light is no longer a security problem so don’t let it cost you time and money. Don’t wait for disaster to strike – protect your site now!